The divide between UX and Web development can be stifling. 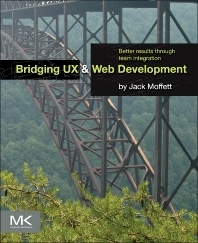 Bridging UX and Web Development prepares you to break down those walls by teaching you how to integrate with your team’s developers. You examine the process from their perspective, discovering tools and coding principles that will help you bridge the gap between design and implementation. With these tried and true approaches, you’ll be able to capitalize on a more productive work environment. Whether you’re a novice UX professional finding your place in the software industry and looking to nail down your technical skills, or a seasoned UI designer looking for practical information on how to integrate your team with development, this is the must-have resource for your UX library. Chapter 4. Why HTML and CSS? Exercise 1: Git ’er Done! With a BFA in Graphic Design from West Virginia University and a Masters in Interaction Design from Carnegie Mellon, Jack has been designing web, desktop, and mobile applications for over a decade. He has worked in both research and industry environments and has been teaching design part-time for more than eight years at WVU. As Senior Interaction Designer at Inmedius, a Boeing Company, Jack’s responsibilities cover the gamut from initial user research and product conceptualization through to implementation and testing. As such, his skill set includes visual design, information design, and front-end implementation. He has designed software tools for Lockheed Martin, Shell, DaimlerChrysler, Eaton, and many organizations within the U.S. military, including Joint Service Explosive Ordnance Disposal, Naval Reactors, and NCIS. Jack has spoken at conferences and led workshops to teach designers how to integrate with their development teams and participate in implementation. He co-founded IxDA Pittsburgh and writes about design on designaday.tumblr.com.